Tube's cutting machine "Roto Laser"
Welding of pressed half-shells "Elbow Stitcher"
Mounting rubber gaskets "Edge Seamer"
Three-roll bending (3+1) "Form Roller"
Swaging machine "Roto Former 63 EP"
Production of round & flat oval flanges - "Flanger"
Four-roll bending machines "Master Roller"
Production of angle stock "Angler"
Automatic flexible duct forming machine "Flex Ducter"
Unrivalled, highly reliable, powerful tubeformer (30 kW) is the only one in the industry that works with any strip 137/140/150/205/215 mm. The most productive spiral tubeforming machine in the world (up to 106 m/min)! Plasma cutting system with a special HVAC software, includes libraries of round, rectangular and oval duct fittings. The ShapeCutter machine is designed for the curved cutting of the sheet metal which is widely used in series production of air-duct fittings. 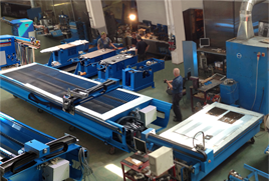 Laser tube's cutting machine produce high accurately cutting of spiral/welded pipes. AutoRounder 800 is an automatic rollformer designed to support high-speed production of segmental elbows. Stitchwelding machine "Stitcher" produces the seam of excellent quality without damaging the electrolyte surface of the welded material. This combination of high reliabile machines is used for radial welding of pressed half-shells bends with diameter from 80 to 315 mm. New model of gorelocker VentFitting DUO combines high safety level, user friendliness and catching design. Both working stations were upgraded on this model. The estimated production time for one elbow Ø300mm from both sides is about 95 seconds. Roll bending CNC machine "FormRoller" is a perfect solution for mass production of pipes of various forms: round, oval / plane-oval, triangular and square tube shapes. The machine is widely used in mass production of ventilation systems, appliances, electrical products and automotive. The motor driven swaging machine is designed for work with metal up to 1.75 mm. The Flanger is filled with operator friendly features and industrial components including the precision ID and OD truing rolls mounted onto a substantial 36 in. (915 mm) square work surface. The CNC 4-roll round bending machine "MasterRoller" is used to get tubes of different shape. The OvalMaster give the operator complete control of the ovalizing process, it offers a full touchscreen PLC control of the stretching mechanism. Producing 90° angles from coil stock, the Angler also automatically cuts to a desired length, and features complete PLC controls and touch screen for easy operation. Universal machine, designed to produce a high quality welded seam on circular parts and oval air-ducts.